The expression patterns of the two distinct subfamilies of genes (designated porA and porB) encoding the light- dependent NADPH:protochlorophyllide oxidoreductases (PORs) in loblolly pine (Pinus taeda L.) were examined. Transcripts arising from both gene subfamilies were shown to be present at high levels in the cotyledons of dark-grown pine seedlings and to a lesser extent in their stems. 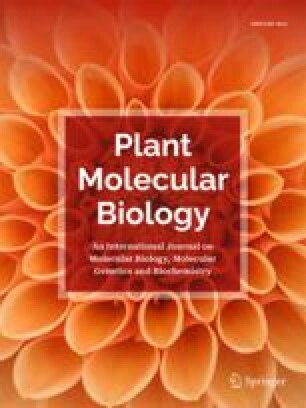 Exposure of dark-grown seedlings to light resulted in increased levels of both porA and porB transcripts, as well as increased levels of mRNAs encoding other photosynthesis-related gene products, suggesting that they are under a common mode of regulation. Relative levels of the porA and porB transcripts were similar in seedling cotyledons and primary needles of two-month-old pine trees, whereas only porB transcripts were present at a significant level in mature secondary needles of two-year-old trees. Immunoblot analysis showed that the 37 kDa PORA protein was most abundant in dark- grown tissues, decreased dramatically upon exposure to light, but could still be detected at low levels in light-grown seedlings. In comparison, levels of the 38 kDa PORB protein were not significantly changed upon transfer of dark-grown tissues to light. While both PORA and PORB were detected in cotyledons and primary needles, only PORB could be detected in mature needles. Transcripts derived from the three plastid genes, chlL, chlN, and chlB, encoding subunits of the light-independent protochlorophyllide reductase were detected in the cotyledons and stems of dark-grown seedlings, and in mature needles. The highest levels of chlL, chlN, and chlB transcripts were detected within the top one-third of the stem and decreased gradually towards the stem/root transition zone. Correspondingly, the highest levels of light-independent chlorophyll formation took place near the top of the hypocotyl. A similar pattern of expression was observed for other photosynthesis-related gene products, including porA and porB. Our results suggest that many aspects of the light-dependent, tissue-specific and developmental regulation of POR expression first described in angiosperms were already established in the less evolutionarily advanced gymnosperms. However, unlike angiosperms, light is not the dominant regulatory factor controlling porA expression in these species.